For the first decade of my adult life, I lived in apartments where the guest room also doubled as the living room, office, or unorganized storage room, etc. During those years the best I had to offer was often a Costco air mattress and a sound machine. And yet, (past guests, feel free to set the record straight here) it didn’t keep us from having a blast hosting family and friends. At the end of the day, all people need to feel welcome in your home is your relaxed, welcoming vibe and the good food you put in their belly. But… if you have the time and space, adding a little intentionality and design goes a long way. Here are 5 ways to make your guests feel like they’re staying at a fancy airbnb. No. 1 A comfortable bed is everything. You don’t have to spend a ton of money to set up a bed your guests will rave about. Splurging on fluffy pillows, quality sheets, and a comfy down blanket is the easiest way to give the average mattress a luxury feel. I like to put a few different pillow options on my guest bed to accommodate different preferences. For example, my mom loves squishy pillows, while my sister prefers memory foam pillows for more support. A couple times a year, Costco will carry down and alternative down pillows and blankets for an incredibly cheap price. And Ikea carries several down and alternative down blanket options to fit in your budget. No. 2 Add a little organization. Even if your guests are only staying one night, providing a little organization will allow them to make themselves right at home. And if they have an extended stay, simple additions like towel hooks, extra hangers, and a dirty clothes bin will keep the room clean and functional. At a minimum, add a trashcan and note with the wifi password. No one likes walking around someone else’s house searching for the trash bin. Here’s a minimal clothes rack I’ve used over and over. 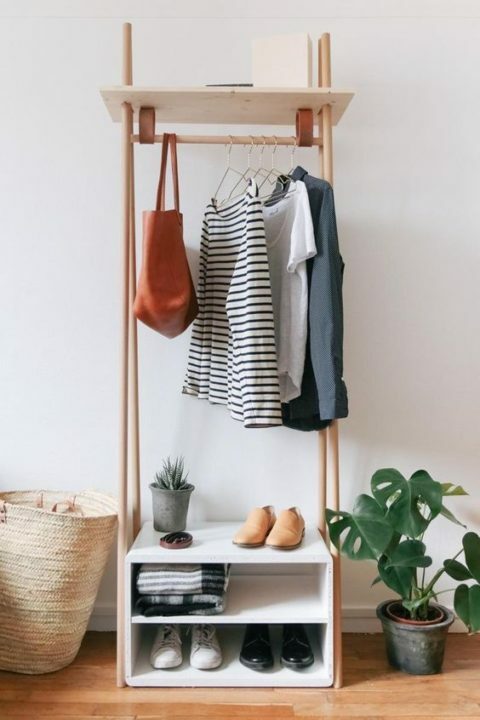 Add 5-10 wooden hangers and you’re set! No. 3 Furnish the room like a Master Bedroom. Make your guests feel like they’re staying in the nicest room in the house. In addition to a comfortable bed, add bed side tables, a chair, dresser or shelf, mirror, and luggage rack. 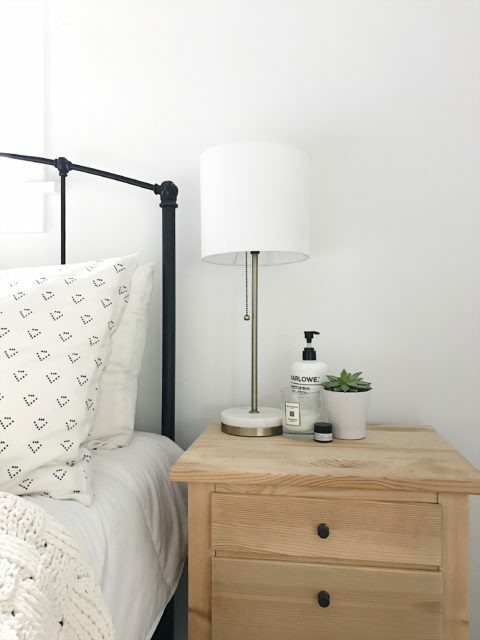 If your guest room is cozy in size, just add one bed side table and a shelf instead of a dresser. Again, you don’t have to break the bank on this one. 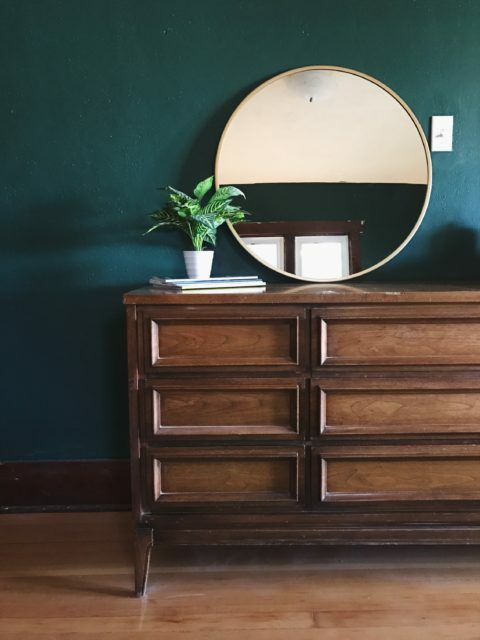 I found my guest bedroom dresser for $50 at a furniture thrift store. 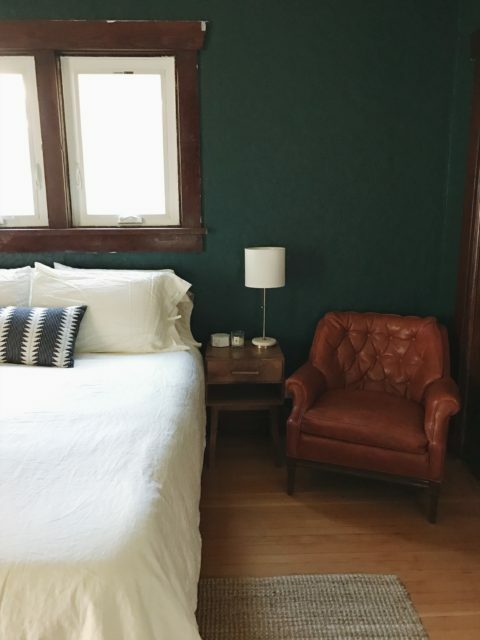 I found a faux leather chair from goodwill for $5, and the bed side tables from Target on clearance at the end of the season. 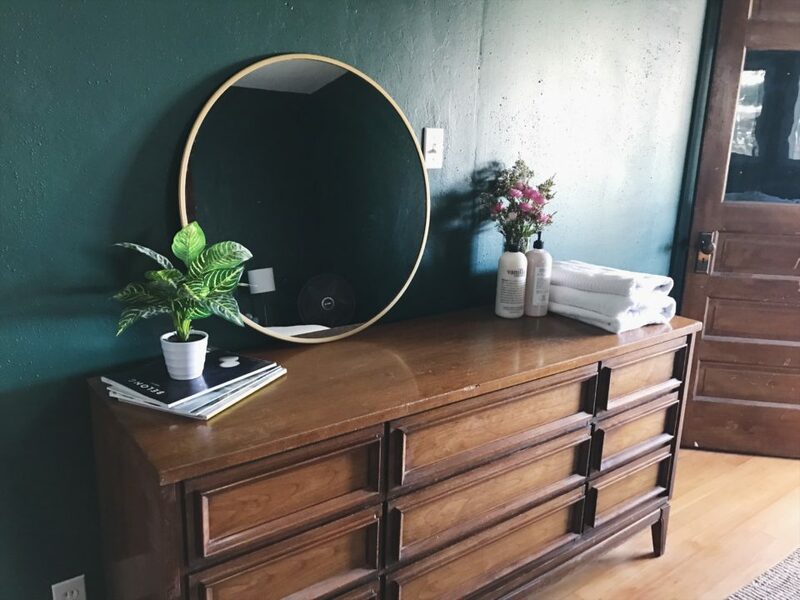 I splurged on this mirror in the picture above. It’s the best price I’ve found for a gold round mirror and fits perfectly in the room. It took me about two months to find all my guest bedroom furniture for cheap, but I saved a bunch of money and wound up with a fully furnished room. No. 4 Don’t underestimate creature comforts. 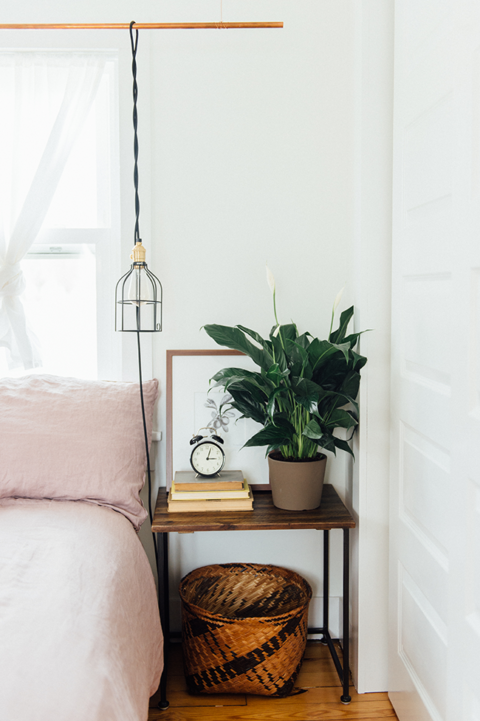 This is by far the easiest and cheapest way to dress up your guest bedroom. Grab a few of your favorite old books or magazines from around the house and stack them beside the bed or chair. Provide a small water pitcher and cup, plenty of tissues, and an extra blanket for reading or sleeping. Call me high maintenance, but white noise while sleeping is a must for me. I have a fan and the only sound machine I’ll ever buy again in my guest bedroom. Between that and the down comforter, your guests will sleep like a baby. No. 5 Add a few thoughtful extras. Colorado has an incredibly dry climate, so I like to provide guests with my favorite unscented lotion and a fresh stick of lip balm. Live plants or fresh flowers add so much to the space, as well as a candle and matches. I also keep a few extra toothbrushes, disposable razors, and small deodorant sticks in the bathroom cabinet in case guests forget one of the essentials. Before your first guest comes to stay, spend the night in your guest bedroom. It will help you figure out what’s missing or what would make the space more comfortable. Additionally, every time someone stays at our house, I ask them what they would add or change to make the guest bedroom more comfortable or functional. I usually get great ideas, especially from close friends and family who aren’t afraid to give feedback.